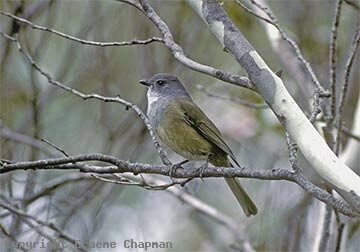 If you live in southern Victoria or Tasmania, the likelihood is that you will be familiar with, or at least have seen, an Olive Whistler. Nowhere could they be described as common, but in Victoria and Tasmania, they are regularly recorded in tea-tree thickets right down to the coast. 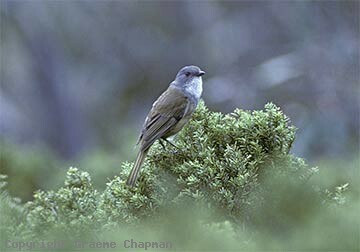 The subspecies "hesperus" is actually restricted to the coastal scrubs of far SW Victoria and just over the border into S.A. In NSW, very occasional records are made in coastal regions but they would be winter visitors which have moved to a lower altitude from their high country headquarters. Breeding birds in NSW and Qld are mostly restricted to the highest parts of the ranges - Kosciusczko National Park, the Brindabella Range west of Canberra, Barrington Tops, New England National Park and up above 1000 m in the Macpherson Range on the Qld border are all known areas. There are no detailed studies, but Olive Whistlers are generally regarded as resident and breeding in simple pairs. The ones I have watched at Mt Ginini west of Canberra nested at about 2m from the ground in dense myrtaceous shrubbery about a kilometre or so from the summit, quite late in the year (eggs in Dec). In winter this area would be covered in snow and then the birds would no doubt have to leave their territories - confirming this, Olive Whistlers used to be regularly trapped in mist nets further down the Brindabella Range in winter. In Queensland, the subspecies "macphersoniana" occurs high up in the border ranges in rainforest which supports a dense shrub layer. For many years during the November Bird Week held at O'Reillys Guest House, I remember the walk to the border, one of the target species being the Olive Whistler. That particular subspecies has a very beautiful and distinctive song (listen on sound page). On the mainland it isn't easy to distinguish the sexes - they are fairly similar and individual variation makes it difficult. Not so in Tasmania - there, adults can be sexed on the basis of the colour of the crown, dark grey in males and brown in females. Freshly fledged juveniles are very rufous overall, but this plumage only lasts a short while, much the same as in Golden Whistlers. 405202 ... Olive Whistler, adult, Mt Ginini, A.C.T. 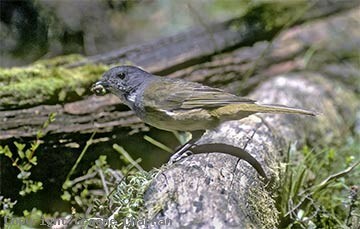 405203 ... Olive Whistler, Mt Ginini A.C.T. 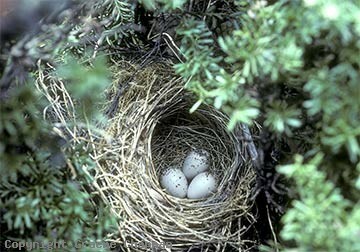 405204 ... Olive Whistler, nest and eggs.